Who doesn’t like to wake up to a mornin’ cup’a joe? For lots of us it’s a ritual, and for people like me it can be the reason I get out of bed, period. It’ll be 8:30am on a Saturday and I’ll be rolling over for another half hour of sleep when I’ll think, “Oooo… I could get up and have coffee!” The next thing I know, I’ll be up. For a long time coffee had a bum wrap – it was simply considered bad for you and that was the end of it. Recently though, a lot more research has been done (notably on people who don’t also smoke) and suddenly that nasty cup of mud water has almost become a health drink. If you do a quick Google, articles pop up on how it reduces the risk of Alzheimer’s, Parkinson’s, type 2 Diabetes, Cirrhosis of the liver, Arthritis and even certain types of cancers, liver cancer being one. That’s a pretty impressive resume for a beverage that used to be ‘bad’ for you. Coffee has also recently been cited as a proven performance enhancer for athletes. A while back I wrote an article on hydration and how coffee, or more precisely the caffeine in coffee was a diuretic and could seriously hinder an athlete’s performance. Even a 10% depletion to our hydration can drastically decrease our muscle’s ability to operate at peak levels. Once hydration drops, less blood is flowing through your circulatory system and therefore less oxygen is getting to your muscles – lactic acid builds up, cramping sets in, light headedness and nausea follows and blammo! You’re done for the day. I should know from stage 1 of 2009 Transrockies. So, in light of the dehydrating effects, I wondered how it was that coffee was being recommended as a performance enhancer for endurance athletes. Well, in a word, caffeine. The very same ingredient that can cause dehydration, can also help you perform at your best. Caffeine can also help with pain suppression, which would make sense since it’s in pain relief and headache medications. It’s not hard to see how these kinds of effects could help an endurance athlete. Being more alert, having increased energy and a more positive mood are all clear advantages. 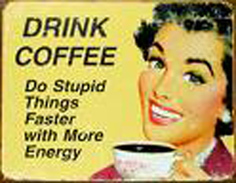 What’s more though, is that recent studies found caffeine is an ergogenic agent. This means it helps release calcium from muscle tissue, allowing muscles to contract with more force, increasing power output. So is caffeine the missing ingredient to your pre-race routine? Should you be downing a few cups of coffee before the big race? Maybe. Some caution though, and this goes back to the risk of dehydration. You wouldn’t want to be loading up on caffeine for days in advance because it would only counteract your efforts to get well hydrated. But if you’ve been diligent about your hydration in the days leading up by drinking your 2 litres of water per day and limiting your caffeine and alcohol, you could indulge race morning if you’re looking for that extra edge. Just be sure to stay on water/sports drinks as well. For those of you who don’t consume a lot of coffee, or caffeine laden products like pop, tea and chocolate, how much do you really need to still get the performance benefits? Well, in a recent article by Gina Kolata from the New York Times you might need as little as 200 milligrams, or 1 medium cup of coffee to see a measurable impact on your performance. A day without coffee is like a day without sunshine! Nice article Sheldon. That’s the wonderful thing about gels – a lot of them also contain caffeine. As a non-coffee drinker I find that the pre-race gel is what gets me going, in addition to the adreneline.